Miura Golf is celebrating Fathers Day by giving away an excellent Miura stand bag -- perfect for the winner, or the winner's Dad. All they have to do is tell the best father-child golf story. Golfers can enter the special contest on Miura's Facebook page. By 'liking' the page and clicking on the special contest button, they can go to a form that allows them to enter information, including their favorite father-child golf memory in 250 words or less. The winner will be announced on Facebook and Twitter on Fathers Day, Sunday, June 16 (also the day of the final round of the U.S. Open). "It would make any golfer smile to present to their Dad -- or their son or daughter -- this great Miura bag," said Adam Barr, president of Miura. "Almost all of us have great memories of golf with our dads, from learning to playing to traveling. It's an honor for us at Miura to collect these cherished memories, and in the case of the best one, reward them." 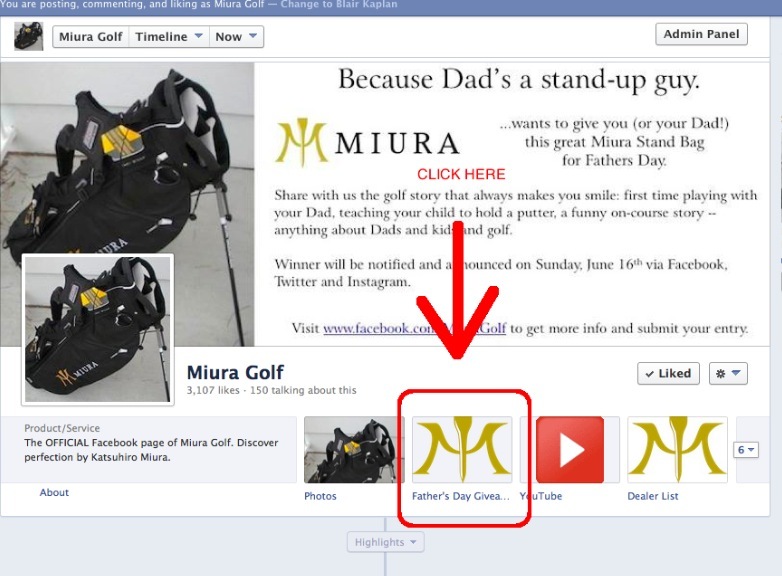 Miura's Stand-Up Dad Contest is underway now at Miura's Facebook page.